Mumbai owes a lot to the Parsi community be it the far sightedness of its visionary thinkers. or their benevolence that helped set up some of the city’s most well-known landmarks, educational and health institutions. In the same breath, the community is also known and loved for its quirky and ‘ unique sense of humor. Celebrating this, is an interesting venture set up by 22-year-olds Hormuz Bana and Viktor Daruwala. 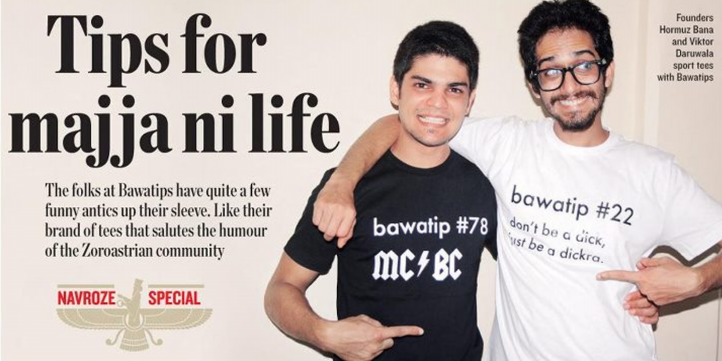 The young duo have set up Bawatips, a social net­working community that acts as a platform to post funny one-liners that are typical to the Parsis. It became a hit with the community as well as others. Today, the page boasts of over 7,COO likes. "It started one night when Viktor called me up after a drinking session at a local bar and said that like the brotips (by the famous character Barney Stinson, from the TV series How I Met your Mother) we should start something like Bawatips that shares everything about a bawa. So, next morning we came up with ten lines and Started the community," says Hormuz. 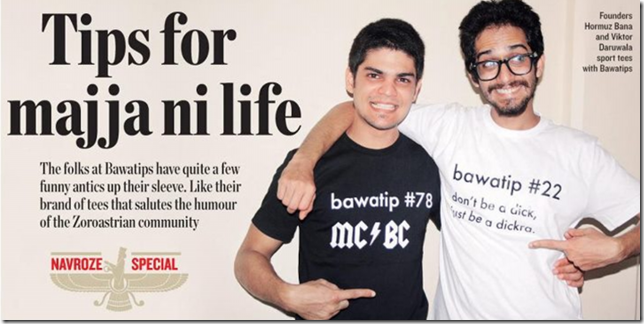 The background of their posts has clinking beer mugs as an ode to a Parsi’s love for alcohol. Even the font has been chosen after much deliberation. "We prefer to think that the bawas aren’t a dwin­dling community, but just few in number. Hence, we use the Futura font by which we mean that there is a future," he adds. ‘When we say, ‘I phone’ we mean ‘this’ phone, you idiot’ and ‘Leave the mustard, try lagan nu custard’ are a few funny examples that otic will come across while browsing the page. Then again, many of their lines also use foul language. Quiz them about the elders getting upset about the use of such language, and Hormuz rea­sons, "It is common with the community, and though, some at first might not have liked it. others took it in jest and understood that we aren’t out there to make a mockery of any­one." They wanted to post their thoughts in a fun way without hurting anyone’s sentiments — religious or otherwise. Bana, who also doubles as a priest takes care of this aspect. "We never expected it to get this popular. So. we fell tliat the best way to take this further would be to print some of the quirkiest quotes on tees. Between 30 to 40 percent of our buy­ers were non-Parsis. They had Parsi friends and connected the tips with their cTaziness. "shares Bana.